Its been a few weeks now since the end of the maritime border incident, which involved the arrest of 15 British military personnel by Iran, a diplomatic crisis and their subsequent release. In April, we posted on the puzzling observation that the UK Ministry of Defence had provided two different sets of position coordinates to fix the site of the incident, and thereby prove that it occurred in Iraqi waters. 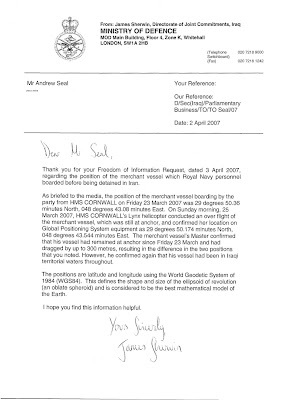 One of these sets of coordinates was quoted in the text of their press briefing, while another is pictured in their photograph taken from a helicopter and described in the caption as the "GPS location of the incident, as seen from a Royal Navy helicopter over the merchant vessel after the event". As both sets of data were presented at the same press briefing it appeared that, at the least, an embarrassing over sight had occurred. The reply again confirms that two different coordinates were given by the MOD as confirming the site of the capture of the British personnel. It also makes clear these two positions were actually recorded two days apart, a fact not made clear in the information released to the press. The difference between the positions is attributed to the dragging of an anchor and is given as "up to 300 metres". Unfortunately, this is just not true. There are several ways to do the calculation of how far away two GPS coordinate locations are from each other. To check out the distance between the two positions we used two methods. This utility uses a Java script routine to calculate great-circle distances between two points – that is, the shortest distance over the earth’s surface – using the ‘Haversine’ formula. The locations were then visualised on the linked Google Map to check for any obvious errors and then converted from km to NM using the conversion 1 kilometer = 0.54 nautical miles. This gives a straight line distance between the two positions of 0.44 NM. For those of us more used to visualising distance in km, the distance between the two positions given by the British MOD as the site of the arrest is 0.8 km. This calculation was confirmed by inputting the coordinates into the GIS software package ArcGIS. In short, the two positions presented by the British government as being 'the site' of the capture are actually 0.82 km apart! Firstly, the efforts to present the British case appear shabby and amateurish. It is also plainly dishonest. A publicity photograph was blatantly misrepresented by the MOD as being the site of the incident when it is actually a photograph of a position nearly one kilometer away. Secondly, the mainstream media fell for the publicity photograph very nicely, failed to check the accuracy of the MOD press release and allowed inaccurate information to be widely disseminated without correction. As it turned out, in this incident things turned out well and the captives were safely returned home. On another day, the misuse of photographic imagery and technical data could cause incalculable damage.